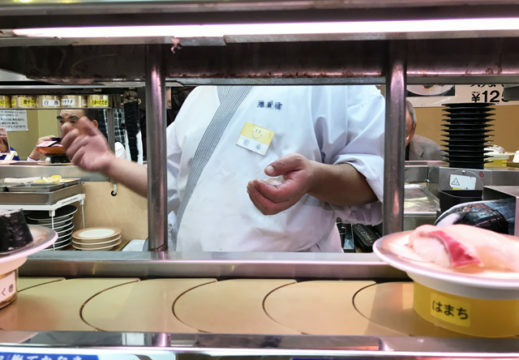 A foreigner mustering up the courage to shout out an order at a conveyor belt sushi restaurant in Tokyo last night was asked to repeat the order. “Sorry, what was that?” asked Chef Nobuchika. “Oh, for f***’s sake,” thought Gaijin Steve. “Did you say you wanted the yaki salmon, or was it the fried potatoes?” asked Chef Nobuchika. The 36-year-old gaijin was fairly confident he had called out ‘maguro futatsu kudasai’ loudly and clearly enough for the chef to hear. Gaijin Steve ended up receiving just one plate of tuna sushi. “Ah, maybe if I say ‘futatsu’ that means two sushi pieces on one plate,” thought Gaijin Steve. Gaijin Steve later requested ‘ni mai’ and received two plates. “Sankyu bery machi,” Chef Nobuchika said as he handed over the two plates of sushi. The other chefs burst into laughter. A few minutes later a local sitting on the opposite side of the restaurant ordered ‘maguro futatsu’ and received two plates. I’m pretty sure that what the 36-year-old gaijin actually said was closer to “magewroe fewtatshoe kewdahsai”, and that he spent the rest of the evening ranting online about how everyone deliberately misunderstands his perfect Japanese. or maybe it’s just japanese people refusing to accept you speaking japanese perfectly fine. which was the point of this post lol not all foreigners speak terrible american-accent-japanese after all. better than the original story! Man, you all realize this is a satire site right? Also real actual person, you realize it’s possible to have decent pronunciation and not even be born in a place, right? Japanese isn’t a particularly challenging (pronunciation wise) language if you try a little.